But the Moscow talks appeared to yield no breakthrough over Trump's stated desire for Washington to leave the Intermediate-Range Nuclear Forces (INF), a step Moscow has decried as dangerous and many European countries have warned could reignite a Cold War-style arms race. "There's a new strategic reality out there," Bolton, who is National Security Advisor to Trump, told a news conference, adding that the Cold War-era treaty did not address new missile threats from countries such as China, Iran and North Korea, and was therefore redundant. "In terms of filing the formal notice of withdrawal, that has not been filed but it will be filed in due course," he said, suggesting it was a process that could take several months. "The problem is there are Russian INF violations in Europe now," Bolton told reporters, repeating an allegation Moscow denies. "The threat is not America's INF withdrawal from the treaty. The threat is Russian missiles already deployed." He said Russia had first illegally tested a land-based cruise missile in 2008 and described its violations of the treaty as "long and deep". 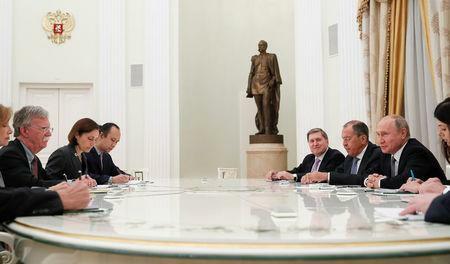 Russia in turn accuses Washington of violating the same treaty, something it denies. "We barely respond to any of your steps but they keep on coming," he jokily complained to Bolton. "On the coat of the arms of the United States there's an eagle holding 13 arrows in one talon and an olive branch in the other. My question is whether your eagle has gobbled up all the olives leaving only the arrows?" But Kremlin foreign policy aide Yuri Ushakov, speaking to reporters after the talks finished, sounded a conciliatory note, saying that Moscow viewed Bolton's visit as a sign that Washington wanted to continue dialogue on the issue. He said Moscow wanted the same thing. Ex-Soviet leader Mikhail Gorbachev, now 87 and an original signatory to the treaty, has warned that unraveling the pact could have catastrophic consequences. Countries such as Poland have, however, backed Trump's move. Trump's withdrawal announcement is causing particular concern in Europe which was the main beneficiary of the INF treaty as a result of the removal of Pershing and U.S. cruise missiles from Europe and of Soviet SS-20 missiles from the European part of the then Soviet Union. Bolton said Washington was "a long way" from making any such deployments in Europe and said grim warnings about the dangerous consequences of Washington quitting the treaty were wide of the mark and reminded him of similarly hollow warnings when the United States left the Cold War-era Anti-Ballistic Missile treaty in 2002. "It was not true then and it will not be true now," he said.